This entry was posted on Friday, April 12th, 2013 at 6:00 pm	and is filed under software. You can follow any responses to this entry through the RSS 2.0 feed. You can skip to the end and leave a response. Pinging is currently not allowed. Thanks for that link. From the article: “Tom works on hardware design most of the time, but is also developing a Push & Shove router for Kicad.” It will be very interesting to see what comes of this! Good news, indeed. I hope the best. I think that this announcement will boost a lot the morale of the community. 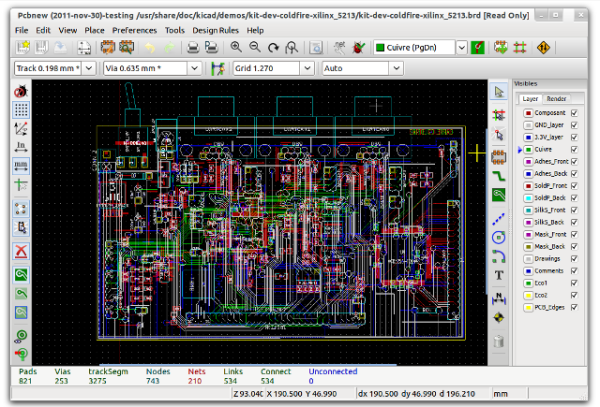 Kicad is already a good tool, and I prefer it over the commercial packages. someone wants to keep me working in nuclear physics!